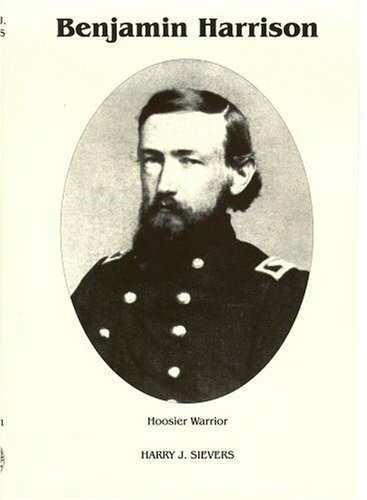 “Benjamin Harrison: Hoosier Warrior” is the first book in a three-volume series by Harry J. Sievers. Published in 1952 (five decades after Harrison’s death) it was the first major biography of the life of the 23rd president. A quarter-century earlier, historian Albert Volwiler was hired by a Harrison-focused foundation to write his biography. But despite almost two decades of exclusive access to Harrison’s papers, Volwiler failed to produce even a rough draft. In 1949 the foundation hired Sievers, then a graduate student, to undertake the mission. Within a year Sievers completed his doctorate. Not coincidentally, his thesis covered much of Harrison’s early life. And within another two years he had completed the biography’s first installment. After several timing and logistical challenges the final two volumes were published over the next sixteen years. The resulting series remains the most comprehensive and detailed analysis of Benjamin Harrison’s life ever published. In addition to being Harrison’s primary biographer, Sievers was a Jesuit priest and most recently served as the Dean of the Graduate School of Arts and Sciences at Fordham University. He died in 1977. This first volume of Harrison’s life covers the years from his birth through his service as the leader of Indiana’s 70th Infantry Regiment during the Civil War (his first thirty-two years). Although my expectations for this volume were limited given Harrison’s reputation for lacking any measure of animation or charm, I found this installment extremely well written and remarkably interesting. The first sixty percent of the book (almost 200 pages) covers Harrison’s life prior to his military service. This portion of the biography provides an excellent and often fascinating review of his early life. In hindsight it is clear that Sievers’s writing style, not Harrison himself, is responsible for this astonishingly engaging introduction. Along the way Sievers frequently relies on Harrison’s own words (often from a letter to family or friends) to emphasize a particular point. His choice of passages is usually perfect and the transitions are seamless. Sievers also extensively footnotes and sources his material. The reader quickly gets the sense this is a thoughtful and historically rigorous document despite the fact it often reads like the screenplay for a dramatic mini-series. Sievers also manages to perfectly balance Harrison’s private and public lives. While the undercurrent always seems focused on the events which prepared him for the presidency, the story never swerves far from his family and friends. And while I would have guessed that Harrison (and the story) might suffer with his personality under a microscope, exactly the opposite proved true. The last hundred or so pages focus on Harrison’s three years in the Union army, ending with his return to Indianapolis following the North’s victory over the South. But while the story of the Civil War can easily prove fascinating, what Sievers provides is more a day-to-day account of Harrison’s life and not a McPherson-style review of the war itself. The reader follows Harrison from one rural site to another while he is often engaged in matters of only minor (or no) importance. Occasionally he takes part in a more substantial action and these moments receive appropriate emphasis. But relatively little of the war’s broad strokes are provided and a reader unfamiliar with the flow of the conflict will learn little of its major ebbs and flows here. Overall, however, “Benjamin Harrison: Hoosier Warrior” proves an excellent introduction to this relatively obscure president. While the book’s earliest chapters are by far its best, the entire volume is rewarding and insightful. Sievers set the bar high in this initial volume by producing a surprisingly compelling and engaging introduction to one of America’s least-dynamic presidents…and he ensured readers will seek out the next installment of this series.